Ethan met Santa for the very first time today! Unfortunately, he slept the entire time -- nothing would wake him up, not even Santa's "Ho, Ho, Ho's". As usual, the preparation for leaving the house was pretty much chaos. We had to change his diaper just before leaving, and Ethan decided to pee again while changing him. Luckily, it didn't get on his clothes, just all over the changing table...BUT, then he immediately spit up all over the cute outfit we were going to have him wear (and that I had been protecting from spills and dribbles all day with a bib). When we tried to get him in his carseat, we couldn't get the straps buckled -- they were too tight! So we had to figure out how to adjust those (although we are happy about that --because it means he has grown!). Finally, we were all bundled up and headed out to Coolsprings Galleria to see Santa. We really wanted to beat after-school and after-work traffic and we did! There was no line to wait in (although one family came up while we were getting pictures). Because there wasn't a line we had time to tickle and move Ethan around, but he just wasn't going to wake up! But we got some cute sleeping baby pictures and Santa told Ethan to keep being a good little boy and to enjoy his First Christmas. 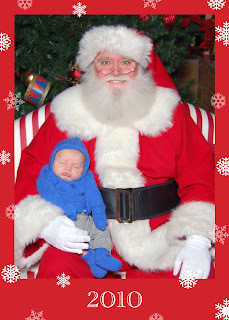 About 5 minutes after we left Santa, Ethan's big blue eyes popped open! Santa's wondering why I'm taking a picture right now. It's because Cayne was very nervous about handing our baby to a stranger! I think the blue sweater we chose works great in the photo! and should have been our first choice instead.